The movie CHAPPiE will surely hit you in an unlikely good way. The movie started a little slow but the plot progressed in the right pace. The play of the events tend to sink you into an intimate dialogue with the main characters. What started as an ordinary titanium police robot evolved into a heart-warming conscious living persona. If you enjoyed the films "District 9", "Elysium", "Wall-E" and "Avatar" this film will surely be a great addition to the films you should see. The film uses a cinematography similar to the style of Elysium with realistic post-apocalyptic urban feel. The plot of Chappie is parallel to District 9 but with recognizable difference. It uses visual effects that are highly realistic and it is as if the robots and machines are truly interacting with the actors. Dev Patel's performance is perfect for the role. Hugh Jackman has given an impressive performance as the main antagonist in the film. 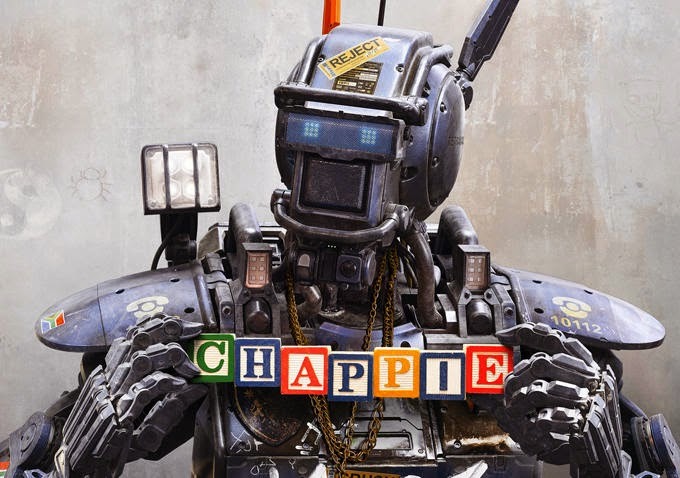 One of the primary strength of the film is the humor and development of Chappie from having a child-like mind into a rebellious puberty stage, and finally into an adult that could think for his own. Chappie (stylized as CHAPPiE) is an American science fiction film directed by Neill Blomkamp. The screenplay, written by Blomkamp and Terri Tatchell, is based on Blomkamp's 2004 short film Tetra Vaal.The film stars Sharlto Copley, Dev Patel, Jose Pablo Cantillo, Sigourney Weaver, Hugh Jackman, and Watkin Tudor Jones and Yolandi Visser of the South African zef rap-rave group Die Antwoord. Chappie is Blomkamp's third feature length film as director. He wrote the screenplay along with his wife Terri Tatchell, who also co-wrote District 9. Overall, "Chappie" is a remarkable sci-fi acton film with a distinct plot that hold together an urban chaotic gun showdown with an unlikely discovery of a heart warming family behind enemy lines. The film used the strength of the acting prowess of its cast and an impressive visual effects resulting in an unforgettable film for everyone.